After leaving Gullfoss (Golden Falls), the last stop was Haukadalur, a geothermal valley that was home to several geysers. 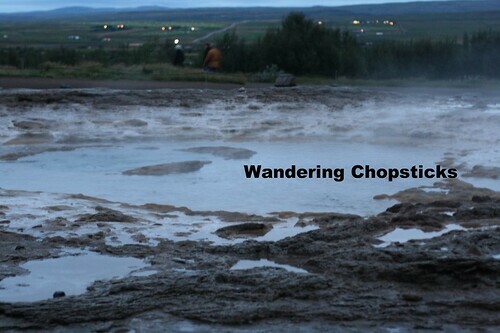 While hot springs are reported to exist in this area for 10,000 years, the Great Geysir wasn't first mentioned until the late 18th century. At times erupting more than 200 feet in the air, the unusual phenomenon caught the interest of people during the Age of Enlightenment. 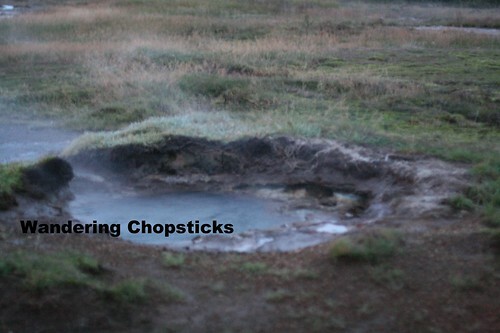 Henceforth, all spouting hot springs were named geysers. 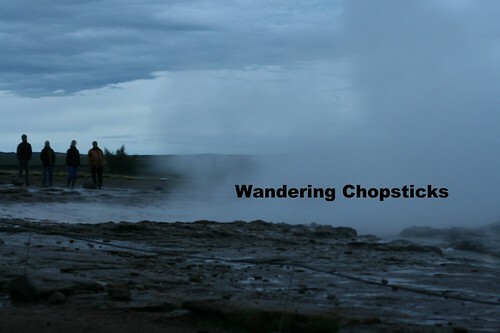 These days though, the Great Geysir rarely erupts, sometimes going for years at a time with no movement. 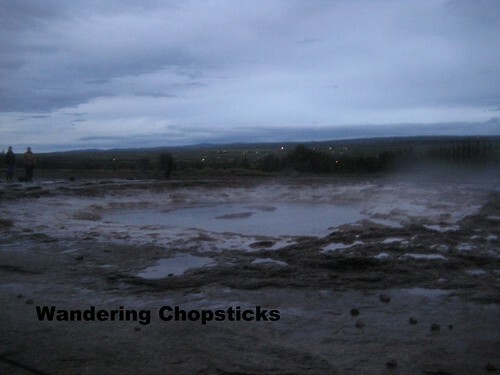 Still, it was worth a visit just to see the original Geysir. 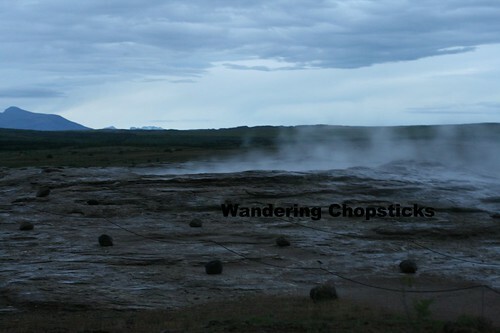 Nearby is Strokkur geyser, which reliably erupts every five minutes or so. After a few quick snaps of Geysir, I made my way over to Strokkur. I was chasing the clock at this point since it was 10 p.m. and daylight was waning fast. 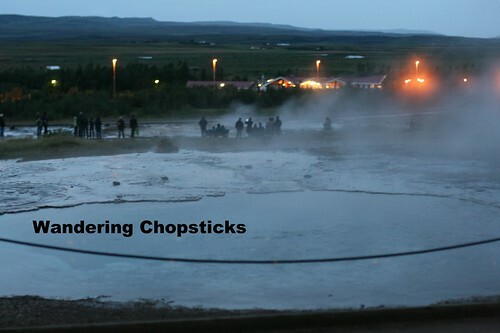 Everyone was gathered around Strokkur, waiting for an eruption. It didn't disappoint. I saw perhaps half a dozen eruptions while waiting. Unfortunately, I wasn't quick enough on the draw any of those times and these were the best photos I could manage. The video is a little pathetic too. By the time I pushed the record button, the eruption was already well under way. If you can't see the video below, you can also view it on my YouTube page. By 11 p.m., it was simply too dark to photograph anything well. But cranking up my ISO, I did manage to take a picture of this mini geyser on the way out. I could hear the water burbling and steaming. Pretty cool! I once saw a documentary in which someone placed bread dough in a tin and then buried it beside a hot spring. The person went hiking and then later came back, dug up the tin, and had fresh hot bread. I wanna do that! Can you believe this was only the end of one day in Iceland?! 1 year ago today, a lone pomegranate on my tree. 2 years ago today, English Cottage Pie. 3 years ago today, Navajo frybread at Ted's Taco - Mancos - Colorado. 4 years ago today, no turtle doves, agapanthus, desert rose, gardenia, and jasmine. 5 years ago today, 1 of 7 random things about me meme: I hardly ever make my own nuoc mam cham (Vietnamese fish sauce dipping sauce). I ate in a restaurant that cooked the whole meal burying the food in hot springs. If you haven't been to the Azores, it is really worth the trip. The people are lovely and the islands really beautiful. Well, I don't know about that, but I do try to enjoy when I go! This is all standard tourist fare though, so it's not hard for anyone to do it too. My cousins say that during the right time of year, daylight is practically 24 hours!